Will The Catholic Church Allow Women To Serve In Leadership Roles? Bishop Nancy Meyer presides over mass at the Indiana Interchurch Center. There are more than 140 Roman Catholic womenpriests worldwide. But the Catholic Church doesn’t recognize them because of a longstanding policy that forbids the ordination of women. Only men can hold leadership roles. Some are hopeful a new commission Pope Francis formed will lead to change. 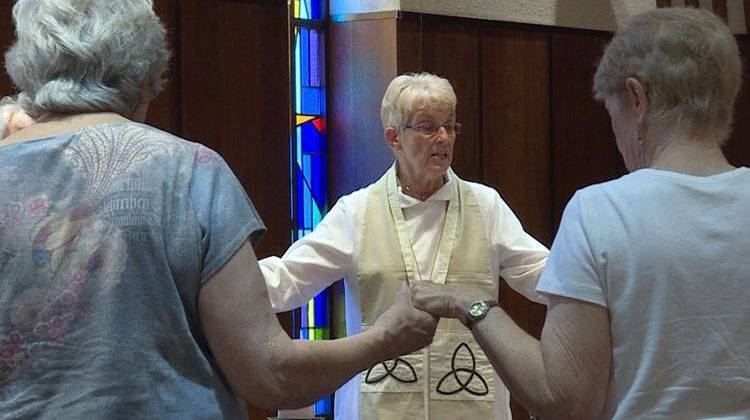 At first glance, the Sunday mass at Indiana’s Interchurch Center in Indianapolis may not appear much different than those you’d see in traditional Catholic churches. There’s singing, praying and the offering of communion. But there’s a woman presiding over the mass. Today, it’s Bishop Nancy Meyer. Meyer is one of several women who leads services for the St. Mary of Magdala Catholic Community. But what’s happening here isn’t sanctioned by the Catholic Church. That’s why the community gathers at the Interchurch Center or at their homes. Pope Francis is examining whether women can serve in the Catholic Church as deacons through a newly-formed commission. Pastor Maria McClain says she’s heard this before. Whether women can be ordained in the Catholic Church has been hotly debated. In the ’90s, Pope John Paul II wrote that the church doesn’t have the authority to ordain women as priests. But Furey says there is evidence in the New Testament that women served as deacons. And there’s a growing movement that supports welcoming women priests into the Catholic Church. “People who argue for the ordination of women think there’s another point that’s really important, and that is the question of, ‘Is this just affirming the patriarchy of the church? Or is this about something that was essential in the early church?’” Furey says. The women with St. Mary of Magdala say there’s no reason they shouldn’t be allowed to serve in leadership roles within the Catholic Church. Meyer says she commends Pope Francis for exploring the possibility of female deacons. She doesn’t expect an immediate change, but she hopes the Pope will listen. “We really need our voices to be heard because we look at things, we do things differently than men,” Meyer says. For now Meyer says she’ll continue serving as a womanpriest with the hope that someday she will be able to do so within the walls of a Catholic Church.